Hand-poured in the US, our scented candles are meticulously made of the highest quality of premium soy blend and essential oil based fragrances - all our fragrances are phthalate free, IFRA approved. 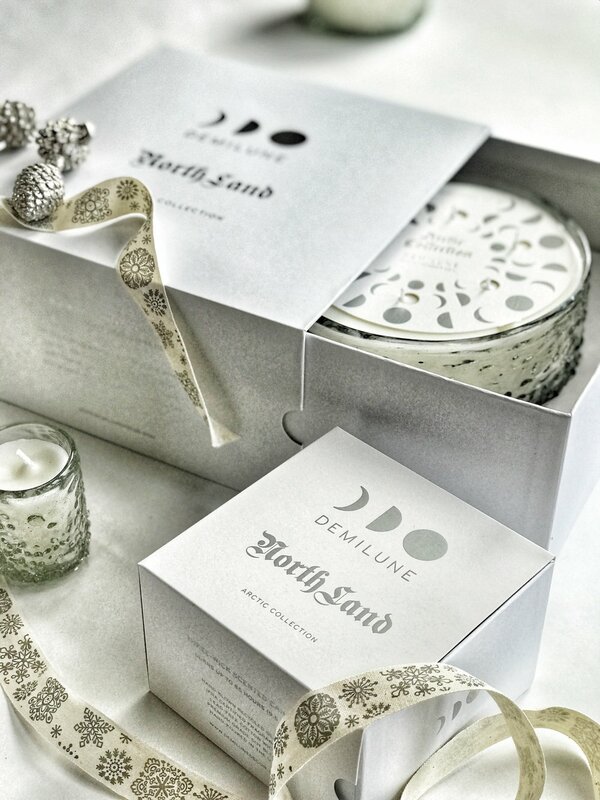 For your peace of mind, Demilune's candles are completed with untreated cotton, lead & zinc-free wicks. Our Arctic vessels are crafted of 100% recycled glass. These beautiful bowls are crafted with centuries-old blown techniques. Paper-thin elements of glass are incorporated into the fused blown glass design. Each vessel is mouth blown and hand shaped by skilled artisans. Our bowls can be re-purposed. They are food and dishwasher safe and lead-free. to help protect polar bears and their environment. Demilune is not affiliated with WWF or its programs, projects or websites. AVAILABLE FRAGRANCE - only available from August through December!